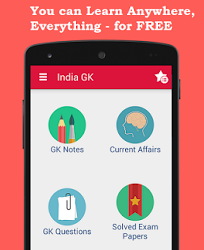 21 to 25 December 2016 Current Affairs MCQs, Quiz, Questions: Current Affairs for December 2016, Daily Multiple Choice Questions (MCQs) for India GK, World GK and current affairs with Collection of daily objective type Question by www.Indiagk.net based on General Knowledge (GK) and General Science (GS) Questions for UPSC, State PSC, SSC, Police exam, Railway exam, SBI, Bank PO, IBPC, SSC, LDC, UDC, Army, Airforce, Navy, Coast Guard, Bank Clerk, TET and all entrance examination with current affairs News, Multiple Choice Questions (MCQs) available on Website www.IndiaGK.net and Android Apps with daily updates:. The 2016 Sahitya Akademi award has been won by which author? Who became 3rd Indian player ever to win the Sir Garfield Sobers Trophy after being named the ICC Cricketer of the Year besides the ICC Test Cricketer of the Year for 2016 on 22 December 2016? Who is the newly appointed chief secretary of Tamil Nadu? Which famous personality has topped the 2016 Forbes India celebrity 100 List?